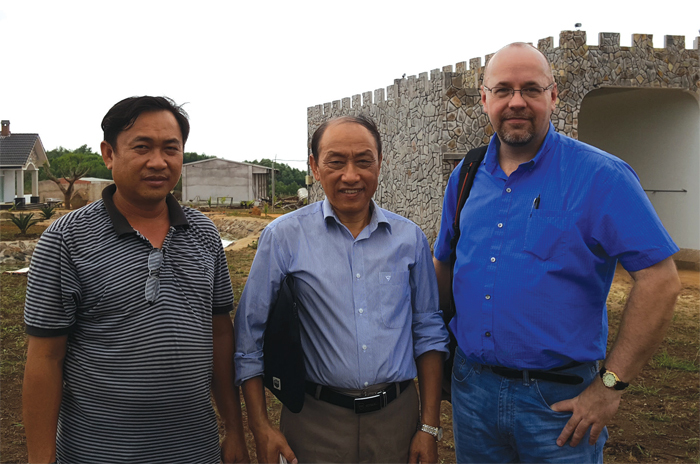 POET Nutrition Technical Services Director Kevin Herrick (far right) along with U.S. Grains Council representatives tour a swine farm in Vietnam. In 2010, POET’s international export market for Distillers Dried Grains with Solubles (DDGS), a nutritious animal feed, consisted of shipping the biofuel coproduct to a handful of companies in five countries. Much of the actual marketing and selling took place through a broker. The shipping itself was outsourced to a third party. Today, POET’s in-house export team coordinates every aspect of an international supply chain that ships roughly one million tons per year of its Dakota Gold — now maybe the most recognized brand name in DDGS — to 29 countries. POET sells another four million tons of DDGS in the United States. The export team has set up a fulltime office in Mexico. They have built relationships from Bangladesh to Brunei, and Colombia to Cambodia. They rent railcars to move shipments to barges and ocean-going freighters that dock in harbors from Ireland to Indonesia. They just finalized the three-year, paperwork-heavy process of getting Dakota Gold registered to sell in Japan. They are scoping out new markets, from Australia to the Philippines. 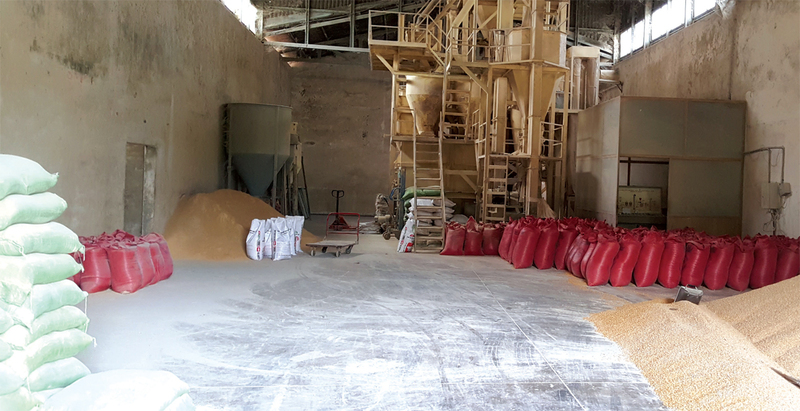 This Vietnam feed mill provides feed to swine and poultry producers in the regions around Ho Chi Minh City. Getting to know those customers includes regular in-country visits by POET partners like Diaa Ghaly, the Global Feed and Grains Director for the U.S.-based Al Dahra ACX, a leader in the animal feed business and POET partner. Ghaly, who got his start in the industry in 1995 as a grain trader based out of Egypt, began working with POET in 2010 and was one of the first people to market Dakota Gold in the Middle East. Today, he’s in Oman, fresh off a flight from the United Arab Emirates. Tomorrow morning, he’ll be meeting with a nutritionist and the buyers for an animal feed company, discussing everything from the attributes of Dakota Gold to bulk pricing to shipping terms. Those attributes include a consistent product (all of POET’s 27 bioprocessing facilities follow the same guidelines to create Dakota Gold), competitive prices and a highquality protein content. Dakota Gold optimizes milk production in dairy cattle; lowers production costs for swine, poultry and dairy; improves digestibility; and enhances yolk color in eggs. If the company decides to buy Dakota Gold, Ghaly will serve as the in-country point person for the POET team back in South Dakota. He’ll explore local ports, research area regulations and help determine truck or train carriers. That service, coupled with Dakota Gold’s history of high-quality results, has made the product a brand name in the region. POET Nutrition Merchandiser David Kiesner at the Vietstock trade show in Vietnam. POET was an exhibitor and presented at a scientific session. Dakota Gold has come a long way in a short time. Early on, POET Chairman and CEO Jeff Broin had recognized that biofuel coproducts — specifically DDGS and, later, carbon dioxide and corn oil — were critical components of income for the bioprocessing facilities. By 2004, POET unveiled its revolutionary new BPX process, a breakthrough that converted starch to biofuel without cooking, which meant better nutrition due to less heat damage. Dakota Gold was born. Dakota Gold is not your average DDGS. POET’s Dakota Gold DDGS is held to the highest standards in the industry. Within the POET system, every pound of DDGS undergoes a strict quality check to ensure it meets those high standards when it comes to the product’s uniform particle size, high palatability (meaning the animals will like its flavor) and high nutrient value. That’s just for POET’s “commodity DDGS.” To qualify as Dakota Gold, the DDGS must qualify for an even tighter quality tests to meet the customers’ needs. Those DDGS are also put though Dakota Gold’s patented BPX process, which increases the nutrient value, maximizes feed utilization and creates the most digestible DDGS in the industry. Today, POET produces over four million tons of Dakota Gold annually, which makes up roughly 85 percent of its total DDGS production. And DDGS have become the nation’s secondlargest animal feed ingredient, behind corn, according to the U.S. Department of Agriculture. While the domestic sales of DDGS have remained relatively stable over the last few years, the production of DDGS continues to increase faster than the production of domestic livestock. Domestically, the total production of DDGS has grown from 40 million tons in 2012 to 50 million tons in 2017. In 2006, according to the U.S. Grains Council, the United States exported 1 million tons of DDGS. In 2017, that number was just over 11 million tons, with Mexico (2.1 million tons) as our top importer. Turkey (1.4 million tons) and South Korea (1 million tons) round out the top three. POET products make up roughly 10 percent of total U.S. exports of DDGS, says Andy Lindsay, Merchandising Manager for POET Nutrition. Lindsay, who works with the container and bulk exports, recently returned from a week in Colombia, where he met with seven potential buyers of Dakota Gold. POET has a history of recognizing long-term trends and shifting outsourced projects to in-house teams. In the early 2010s, when POET saw that potential for international growth of DDGS, they began making plans to bring that outsourcing in house. 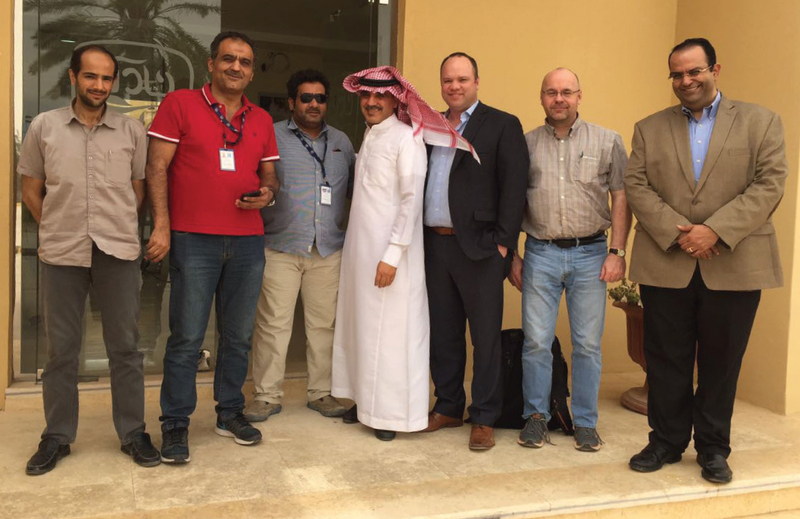 POET Nutrition Vice President of Trading & Merchandising Isaac Crawford, POET Nutrition Technical Services Director Kevin Herrick and Aldahra representative Diaa Ghaly meet with Nadec Dairy in Saudi Arabia. Nadec is one of the largest dairies in Saudi Arabia and is milking close to 75,000 cows. While they hadn’t been hired directly for this project, Crawford, Skuodas and Lindsay — all of whom started at POET roughly six years ago — soon found their focus on the international marketing, sales and shipping of DDGS. The focus also shifted to those direct relationships with customers.